Austin Lee attempts to take down his opponent. Northborough – There are takedowns, reversals, near falls and escapes. Matches can be won by technical fall, chokehold, decision, major decision and default. Body weight means everything. Grapplers range in size from 106 to 285 lbs. and are very strictly matched with opponents of identical weight class. 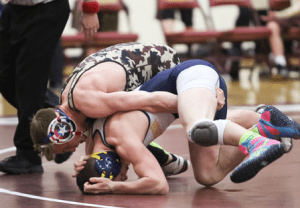 Indeed, the sport of high school wrestling has a vernacular and parameters all its own and perhaps no team gets it more this season than the Algonquin Regional High School varsity wrestling squad. With a regular-season record of 17-6 heading into the final week of the season, it’s been a year to remember for the Tomahawks who now tenaciously prepare for post-season competition. “I’m very proud of the team this year,” said fifth-year Algonquin head coach Brian Kramer, who is assisted by James Gray. “The talent level has been growing and the numbers have been slowly creeping up. The season’s going very well. We have some real strong athletes. Wrestling, like some other sports, is individualized yet team-oriented. When it’s you and you alone on the mat struggling to conquer your opponent, it’s one-on-one but keeping the theme of team first is critical, say coaches and athletes. Encouragement and support from teammates makes a difference. “When I get out on the mat, I’m thinking about myself but I’m also thinking about what’s best for my team,” acknowledged senior co-captain Austin Roche. “Just winning a match may be good for you but not enough for your team when you have to have a pin. There’s a lot of pressure from a team standpoint perspective. 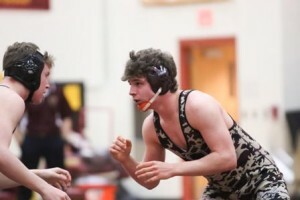 While captains Roche, Cozzolino and Bryce Finnegan are diminutive in stature – they range in the 126-138 weight class – there is no mistaking their mental and physical toughness. Handshakes post-meet prove that these are disciplined young men, stronger physically more than their size might project, but also that they have learned to handle the mental rigors of the sport. Injuries occur but are not as pervasive as one might imagine based on the physicality of the sport, according to Kramer. The team has practiced or had matches six days a week, at least two hours a day since the beginning of the season. Sectional competition is looming and although he refuses to predict outcomes, it is clear that Kramer is proud of his young men who compete with determination and intensity. Members of the 2015-2016 Algonquin Regional High varsity wrestling team are seniors Austin Roche, Garrett Powers, Matt Franks and Ross Grasso along with juniors Bryce Finnegan, Drew Cozzolino, Curtis Clark, Nate Porteus, Angel Aponte, Colin Robinson, Nick Ferreria, Neil Nadgir, Wylie Ith, Connor Truex, Jeff Fontecchio and Joe Vencile. Underclassmen are sophomores Jack Golden, Jake Kerr, Walker Haskins, Austin Lee, and freshmen James Mahoney, Shea Garand, Milosz Dworakowski, Diggy Khurana, Andrew Goddard and Mark Finnegan. Shea Garand attempts to pin his opponent to the mat. Nathaniel Porteus stares down his opponent.